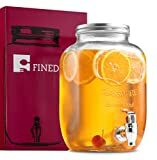 This cool new Fridge Beverage Dispenser is a rustic, space-saving take on the traditional refrigerator drink dispenser that combines a large glass mason jar with a screw on spigot lid. 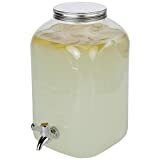 Fill it with water, lemonade, iced tea, sangria, infused fruit drinks, cocktails, or anything you'd like through the wide mouth opening, screw on the lid, and lay it on its rectangular side in the fridge to chill it down or place on the edge of a table or countertop when entertaining guests. It's even better when you drink your beverage from a normal sized mason jar... with a splash of bourbon of course.